Friendly fracking: Bridging fossil fuels and renewables. ‘Fracking’ has become the ‘f-word’ of the energy sector for environmentalists over the past few years. While the development of shale gas formations has been active for decades, recent innovations in horizontal drilling of rock formations and hydraulic fracturing have caused the practice to explode lately as a means of harnessing natural gas. By injecting a mixture of sand, gas and chemical additives (the proppant) at extremely high pressures into a gas-bearing formation, hairline cracks are formed radially from the horizontal well which allows hydrocarbons to flow freely to the well from the rock unit. Where is all this natural gas in Canada? The most prominent shale gas plays in Canada exist in northeastern BC and northwestern Alberta, contained in the Horn River and Montney geological formations. Significant resources also include the Colorado formation in south-central Alberta and southern Saskatchewan, the Utica shale between Montreal and Quebec, and the Frederick Brook/Horton Bluff shales extending from southern New Brunswick to central Nova Scotia. What are the benefits of hydraulic fracturing for natural gas? Although it’s easy to turn our heads from fossil fuels altogether in the discussion of dominant future energy sources, natural gas should be recognized for its advantages in the atmospheric pollution category. Compared to coal power plants, natural gas operations release less than half the CO2, less than a third of nitrous oxide compounds, and only 1% of SO2 emissions. However, this does not necessarily incorporate the energy used in extraction efforts. Canada in particular poses a wealth of shale plays in fairly remote regions, and responsible extraction of these resources will undoubtedly be a massive stimulant to the country’s economy. New Brunswick, for example, has vast revenue potential as a province entering the scene of shale play development. New Brunswick is projected to receive only 1.3% of their revenue for 2014-2015 from developing resources—all of which will be based on mining and forestry. The province will unquestionably benefit from economic growth if they tap into their extensive shale formations spanning the southern part of the province. As an example of economic stimulation due to fracking operations, the Marcellus Shale of Pennsylvania has sparked over 28,000 jobs south of the border. 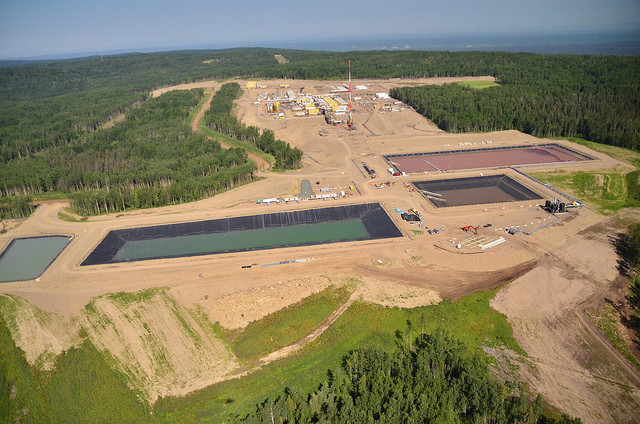 Despite the unruly opposition hydraulic fracturing often receives, it’s important to note that 175,000 wells have been fracked in Canada without significant harm; of those, only one documented case of direct groundwater pollution has surfaced as a result of injecting fracking chemicals for natural gas extraction. In forming an opinion on a topic, it is necessary to understand both sides of the story. Fracking has certainly opened up a cost-effective pathway to accessing a fossil fuel environmentally superior to coal (which is still used to generate ~7% of energy for the country), and its economic benefits should not be automatically dismissed. Although it has a more efficient energy output than renewable sources, the environmental footprint of hydraulic fracturing is still several sizes larger than solar, wind and many renewable energy operations. The euphoria of developing shale gas plays in light of hydraulic fracturing technology is precisely what may bring greater consequences down the road. The International Energy Agency proposed a 250 year approximation for the length of time natural gas could supply the world based on their current production rates. Although this estimate would be disproved by a number of economic, environmental and regulatory factors (not to mention the near-certain inability to maintain current production rates for 250 years), the stat is still large enough to allow most politicians to sleep soundly knowing this resource could be exploited for the foreseeable future. Despite its capacity to replace dirtier fossil fuels, many fear that the explosion of the natural gas industry may dwarf lower-carbon energy sources such as nuclear or renewables. The proliferation of shale gas developments will also amplify a primary weakness of the technology: leakage of methane gas. The incidence rate of methane leaks from gas wells resulting from faulty sealing of wells is 1 to 3%. As we all know, methane is a more significant greenhouse gas than carbon dioxide, molecule for molecule. So, if the issue of methane escaping from wells is not terminated, then the effect of hydraulic fracturing on climate will grow exponentially with the number of wells being developed. Accidental spills of proppant or wastewater on-site. How can these risks be eliminated? A gel-based fracking fluid has been invented by GasFrac, a company who is attempting to downsize their environmental footprint by eradicating the need to drain contaminated water from their wells. Propane is a key component to this viscous fluid, and since the gel retains sand better than water, natural gas extraction in achieved with an eighth of the fracking fluid conventional methods require. Another innovation in fracking fluid technology went on the market a year ago when UniStem unveiled a combination of chemical additives allowing “grey” water and brine pumped from underground to be reused at a site. Although methane leakage from well casings receives most of the attention around environmental drawbacks to fracking, cleansing wastewater of the brine, metals, radionuclides and hydrocarbon compounds it contains is no small task. Hallibutron developed a “CleanWave” water treatment system which combats this issue right on the fracking site with an electrocoagulation technology to destabilize and collect pollutants. A number of hydraulic fracturing players are also looking to replace the diesel in their drilling and pumping machinery by transitioning to natural gas-powered equipment. In 2013, Houston-based oil and gas operator Apache became the first company to complete an entire fracking job entirely dependent on natural gas power. In addition to reducing their GHG emissions, this also cut their costs by 40%. The concern of methane escape is being addressed by a mobile monitoring system created by Germany’s Karlsruhe Institute of technology. Researchers from the university have developed a portable proton-transfer mass spectrometer which enables them to study specific pollution sources at a fracking site by measuring where hazardous aromatic hydrocarbons are being released. This vapour capture system has already proven its worth at fracking sites in Utah and Colorado, detecting organic pollutants at 1000 times their mean concentration in urban air. In summary, renewable energy sources contributed 18.3% of Canada’s total primary energy supply as of 2012. Natural gas weighed in at 33.2%, nearly equivalent to the fraction supplied by crude oil. As long as shale gas development does not cast a shadow on clean energy investment, hydraulic fracturing can potentially be used for the benefit of Canadians over the coming decades. Since the natural gas sector is still in its early stages in Canada, we have the opportunity to spend more time and effort looking into the measures that will steer clear of adverse environmental impacts as the technology and scale of operations matures nationwide. There's seaweed in your chocholate milk.